I never really wanted to make a book. I was content with uploading the videos on YouTube to get the information out there. However, a UFO researcher convinced me of the importance of having this information in print form. So I designed Volume 1 of What Is In Our Skies and published it through Amazon. Signed copies are available through me by sending me an email. The contact info is at the bottom of this page. Available through Amazon.com in America, the UK and Europe. The book retails for $24 but can usually be found for $21.60 or sometimes as low as $17.59. Click here to go to Amazon. This eye-opening introduction into exposing and documenting the mysterious cloud-craft found in our skies is both an exemplary introduction to the topic and an effective means of disseminating this knowledge in a physical media. Author Sean Gautreaux's inspired and cutting-edge renderings offer a level of depth and understanding to the subject matter that is unrivaled in this field of study. Additionally, his photography reveals further technical expertise as well as provides substantial evidence of these craft. Both the renderings and photographs presented in this book work in conjunction to provide an airtight argument for the presence of these mysterious entities in our skies. Sean Gautreaux provides a concise and comprehensive introduction for those not yet versed in this elusive subject, as well as a quick and easy tutorial on how he captures these craft on film in his very own back yard. Beyond that, he provides those already involved in the community with an invaluable reference source and the wealth of his own experiences with these craft. Gautreaux makes no unsubstantiated claims in his work, providing overwhelming amounts of evidence in this volume for all of the topics discussed. He is also extremely transparent, disclosing the methods with which he captured photos, as well as clearly denoting the type of photo/spectrum manipulation used (if any) in his captures. This volume is an extremely useful informational resource for both those uninitiated to the exposure of cloaked craft in our skies, as well as those actively trying to discern the truth behind these airborne objects. Sean Gautreaux has provided us with an invaluable tool in this book, and has hopefully started a trend of further high-quality physical documentation of this pursuit. 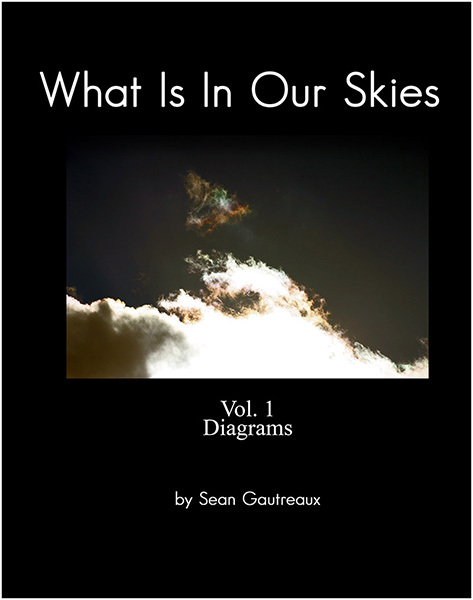 This book should shock and provoke EVERYONE to pay attention to our skies.The work being done by it's incredibly talented and visionary author Sean Gautraux, is a small sampling of material that is presented in much greater detail in his 1-19 video series at his web-site www.whatisinourskies.com. A mind-blowing tour through pictures, diagrams and cutting-edge research regarding the craft that linger in our clouds, that use cloaking technology, that can create and manipulate weather ( including lightning), and that most people are completely oblivious to. The tie-in to chem-trail spraying is especially ominous and out of this world. This book is an amazing primer for anyone who has a passion for the TRUTH! Mr. Gautreaux has done humanity an invaluable service with his pictures, diagrams and videos. This information will hopefully lead us all to a new awareness by exposing some very weird, dark and hidden technologies and agendas. Sean Gautreaux is a genius and true hero. Buy this book, and spend as much time as you can listening and watching his videos. Sean Gautreaux is a pioneer whose spend the last few years researching and observing suspicious sky activity. His artistic insights and geo-meteorological observations come together brilliantly in this book and his series of videos on the subject matter. If you have any doubts that there are larger forces at play in the sky, manipulating our weather system and oceans, watch his videos and read this book. It will open your eyes to what is *really* in our skies!